>I realize I haven’t put anything up in some time. So instead of blabbing I’ll just show you some pics of what is going on. It was our chance this month to host Snobby Dinner Party. We did classic French food. 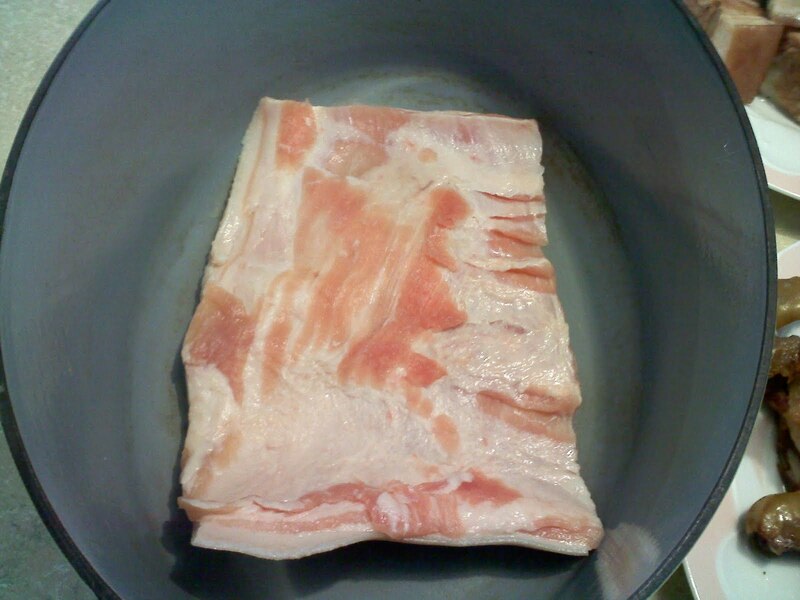 Very heavy, very meaty, peasant-type food. I forgot to take a picture of the dessert which was a caramel custard sponge cake flambe with rum soaked fruits. 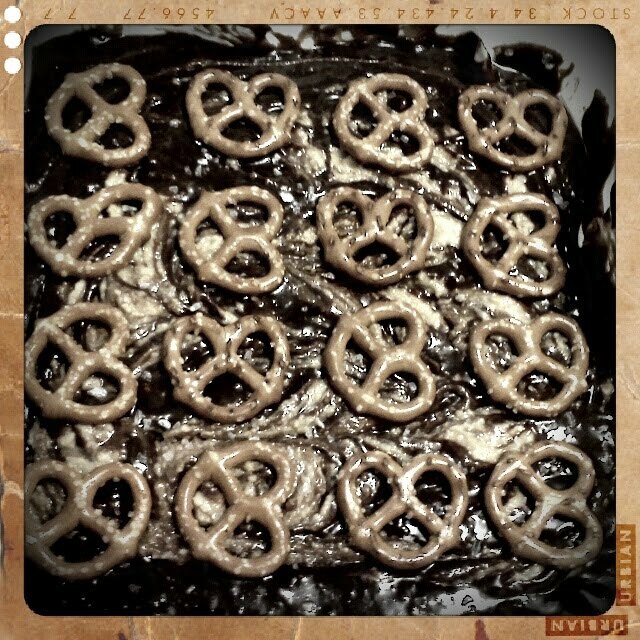 The peanut butter chocolate brownies with pretzels and sea salt that I made for derby several months ago. 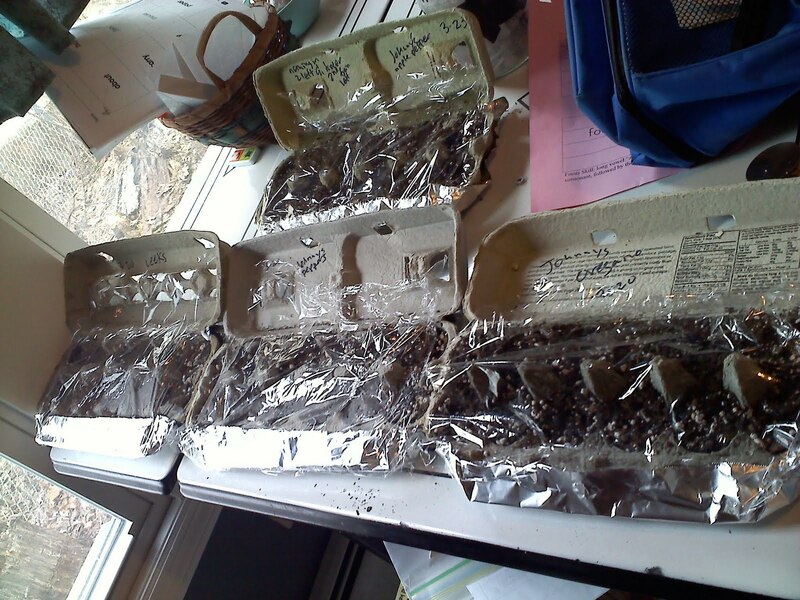 Our seedlings so far: leeks, oregano, and two types of peppers. 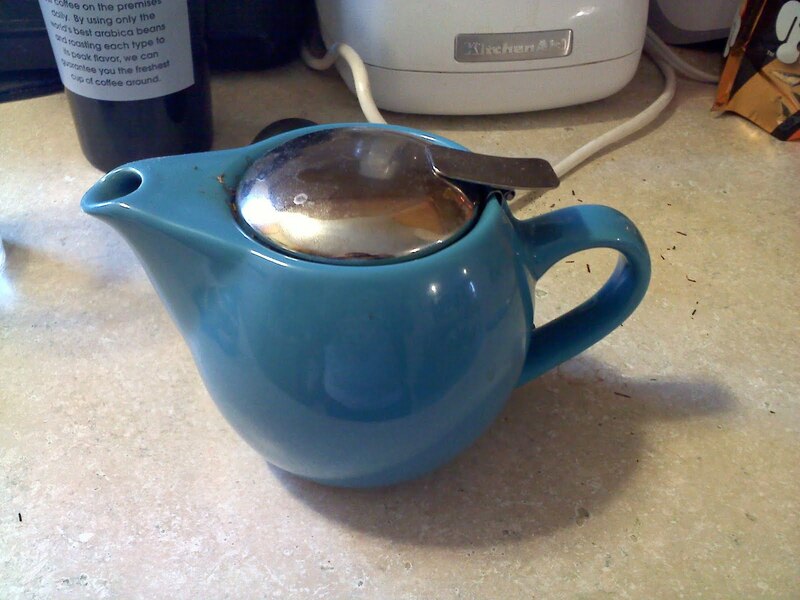 Our teapot. Jack and I have been have “tea time” in the afternoons lately. 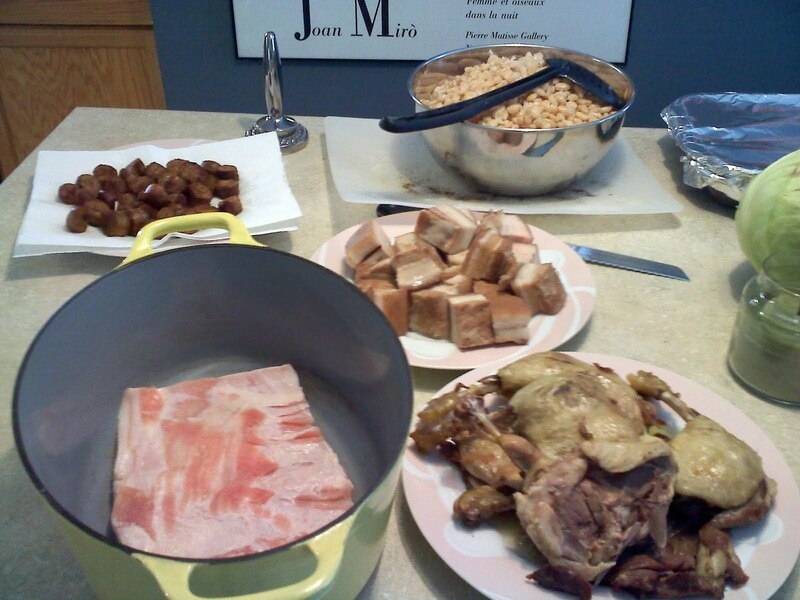 All the ingredients for cassoulet assembly. 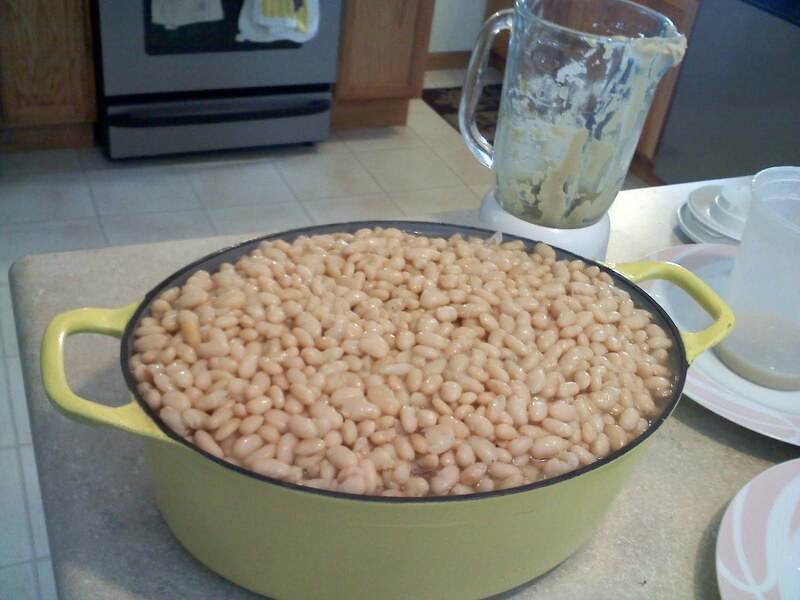 It’s pretty much tons of of meat and fat with six cups of beans. 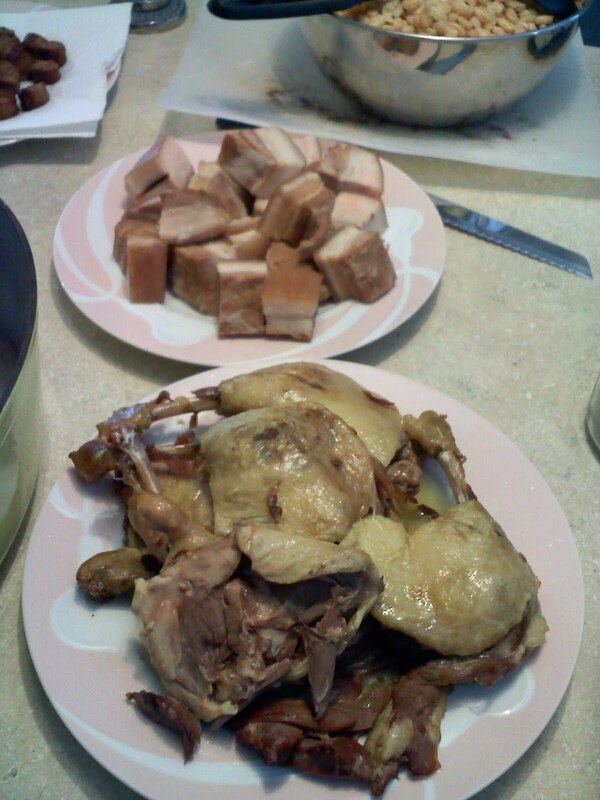 Pork belly and the duck legs that Chris “confited” back in the fall. 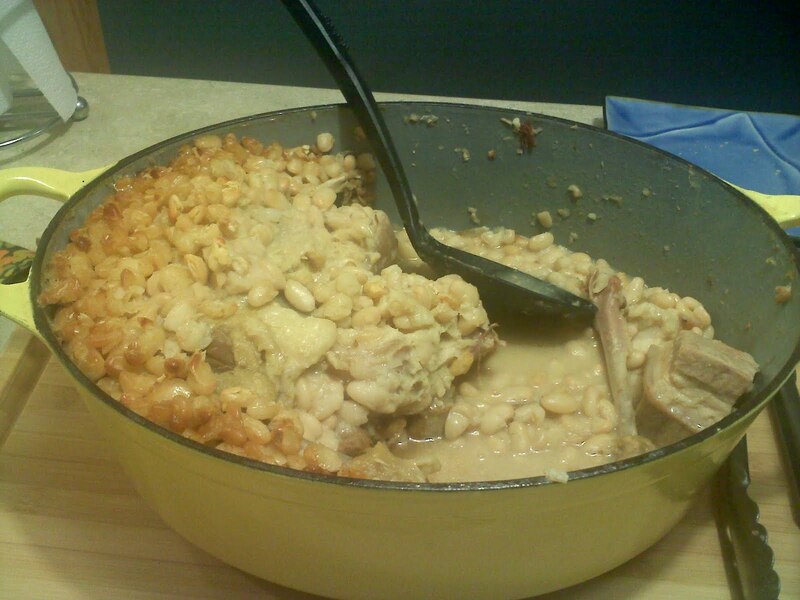 The bottom of the pot has pork rind in it. Rillettes. I should’ve take a fancy photo before everyone started eating them. We were too excited though. Oops. 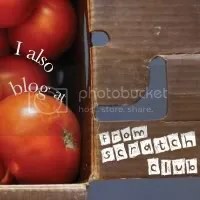 This entry was posted in Uncategorized on March 29, 2011 by Erika T..
>A friend emailed me this morning to tell me she had seen my blog link in my signature for my posts over on Cafemom and that it’s been very helpful to her. It was the first thing I read when I got online early this morning and I’ve been thinking about it all day. I don’t know if this will ever be one of those blogs that has 1,000s and 1,000s of readers (dubious, especially since I don’t post every day), but really if even one person gets something good out of it, that’s plenty enough to make me smile. It was kind of her to let me know. So a big “thank you” goes out to her and anyone else who takes the time to read all of this. I’m going to go relax for a bit before our last DPH pre-bout dinner later tonight. I have that awful feeling in my gut that I had during the dress rehearsal for the last play in college that I ever did. Tomorrow will be the end of a super awesome era, that’s for sure. This entry was posted in Uncategorized on March 18, 2011 by Erika T..
>Please, please learn skills that could help you or your loved ones. Learn how to garden, how to put up food, how to sew basic clothing or mend clothing. There’s no end to the things you could or should learn. No matter how much I know, there is so soooo much I still do not. I don’t know animal husbandry, or how to slaughter or hunt animals. I don’t know proper rotational farming, and still can’t preserve food without reading instructions. I don’t know how to make cheese. I don’t know how to clean and save seeds. The list of what I would like to know goes on and on. But I never give up trying to learn more and more all the time. It’s so important, I just can’t stress it enough. I know this sounds crazy or spooky, but that’s not my intent. People who lived just 100 years ago knew more about how to really, truly live than we do now. They would be horrified to see how things are now and how little we rely on our own instincts. As of late, the world is a scary, tragic, confusing place. But there are also great people, doing great things in communities all over the world. Even if you take up knitting or soap-making as a hobby, it’s a hobby that can serve a purpose. So pick one, and just get started. Find like minded people, and do it together. Then find someone else, and teach it to them. This entry was posted in Uncategorized on March 17, 2011 by Erika T..
>I think Chris put it best the other day when he said, “I love winter but this is crazy. It’s almost mid March!” I should point out that I enjoy the fact I finally live somewhere with 4 legit seasons. Not just “Hot as hell or manageable” or “11 months of rain and 1 of sunshine.” But I’m supposed to be thinking about getting my garden ready and spring home projects and there’s still 3 feet of snow outside! On Sunday it was raining and a little warmer and things were melting. I was so happy. Then, that night driving home from practice, it started snowing again and I spun my car out on the highway. It’s bumming me out. It’s making me incredibly tired and unmotivated. There’s so much I could be doing but I’m barely doing any of it. In 2.5 months things need to be in the ground and growing. Fencing materials purchased, things painted, things repaired. All I want to do is sit on the couch, watch back to back episodes of 30 Rock and eat old Halloween candy. I hate being unproductive. I feel pathetic, like I’m not earning my keep. I feel like one sluggish day just keeps blending into the next one. I feel like all those pretty shoes in my closet will never be worn again and I’ll be stuck with my gross winter boots for the rest of my life. I know it will get better though. The sun is already shining now when the alarm goes off, making it that much easier to get up and on with my day. Plus I know this summer I’m going to be insanely busy. Probably the busiest summer of my life and I will look back to these lazy days on the couch and wonder what I was complaining about. When I finally see grass I’m going to feel like Columbus landing on the shores of the New World. I’m going to want to kiss it and weep. I honestly can’t wait for a sunburn at this point. I want to drink beers outside on a hot night and see dirt under my finger nails. This entry was posted in Uncategorized on March 10, 2011 by Erika T..